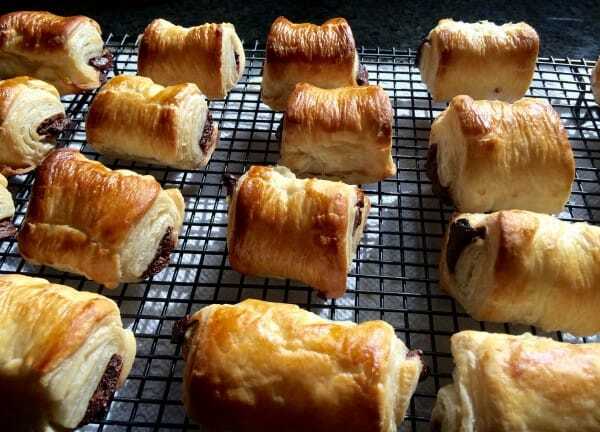 I took mini chocolate croissants out of the oven, let them cool briefly, and then dashed out the door with them to go pick up my kids at school. 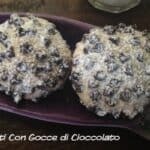 The smell of warm bittersweet chocolate was killing me as the aroma concentrated inside my car. I imagined how excited my kids would be when they were greeted by this bakery scent. Then I patted myself on the back and said to myself, “You rock.” I couldn’t think of anything more awesome than greeting them with pastries just out of oven. In fact, I would like to be welcomed this way. Needless to say, my kids loved the bittersweet chocolate croissants. I let them eat the messy, flaky treats in the car because we were scurrying to get to the ice skating rink after school. Well, more like crawling down the crowded 405 freeway in LA traffic. When we arrived at the ice rink, my 12 year old daughter took off and pirouetted away as she is an experienced ice skater. Now it’s my 8 year old daughter’s turn to master the ice. I watched her intently as she tried. She was solid on the ice. Strong, not wobbly. Her eyes were fierce, focused, and intense. I saw determination and excitement on her face and sensed a strong life force flowing through her. And, in that moment that I saw her so alive, I was reminded that this child almost died. I was overcome with emotion, and tears ran down my cheek. Witnessing her joy became all the more precious to me. My younger daughter was born two months prematurely at just over 2 pounds. When she was one week old, she caught an infection in the hospital. The virulent bacteria spread throughout her body and nearly took her life. By some miracle, she made it and started to thrive. We have been on a bumpy road with her. Although, she has a normal, happy life, she has been through several more health episodes that have included hospitalizations and surgeries. I watched her fight for herself all those times, just like I watched her intensity at the ice rink. She used every fiber in her being to remain upright as she moved across the ice. It’s her sheer determination and life force that has kept her here. Conquering the ice should be easy compared to everything that she has overcome already in her short life. So why do I drag up the past? I get so annoyed when my painful emotions bubble up and throw tears on a happy situation. I think that my memories get triggered when I see my daughter’s determination and passion for life. I am reminded of the other times when these strengths have served her well. In addition, it’s because of these memories that I do not take the precious moments for granted. The joy and triumphs are all the sweeter in contrast. I tried to pull myself together at the ice rink when I became overwhelmed with a swirl of mixed emotions. All at once I cried from past trauma, drank in her joy, and beamed with pride. Then I reminded myself that sometimes life is hard, and sometimes it’s miraculous. Life and its emotions are messy and bittersweet, just like my chocolate croissants. 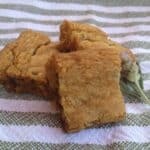 I adapted this recipe from Kimmie of Bake.Love.Give. 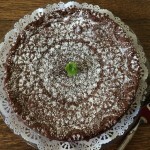 Check out her dessert blog for creative baking ideas that are perfect for gifts and bake sales. The beauty of this recipe is that it uses just three ingredients. The shortcut is premade frozen puff pastry dough which can be found in the freezer section of most markets. Make sure you are buying “puff pastry,” not phyllo dough or pie crust. I found these handy small squares of puff pastry at Bay Cities Italian Deli in Santa Monica, CA. They are five inch squares, as seen in the photo above. However, frozen puff pastry commonly comes in large sheets and can be cut to size. Also, I used the baking instructions that came with my brand of puff pastry as a guide and then adjusted the time based on watching for doneness. I recommend doing the same. 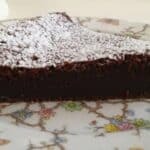 In addition, a Ghirardelli chocolate baking bar conveniently breaks into squares which are easy to use for this recipe, but any chocolate will work just fine. With three ingredients, warm bittersweet chocolate mini croissants can be yours. Defrost puff pastry in the refrigerator overnight. Or one time I winged it and let the pastry defrost on the kitchen counter for about a half hour. Line a cookie sheet with parchment paper. Working on a cutting board, cut a puff pastry square in half, and work with one half piece of dough at a time. Brush top of pastry dough lightly with egg wash. Place a half square of chocolate on the short end of the dough near you. 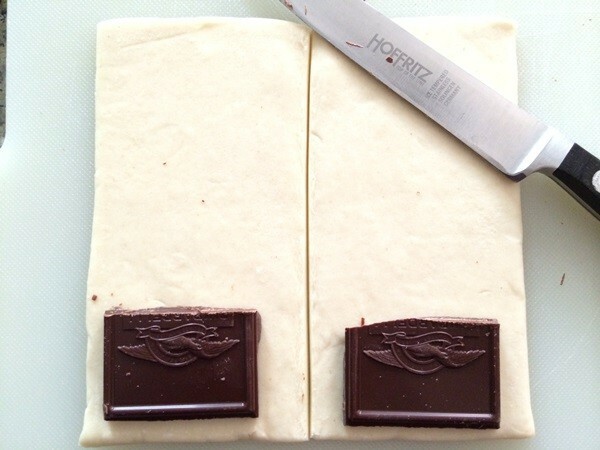 Flip up the dough and chocolate together and keep rolling so that the dough fully wraps around the chocolate. Place the dough with seam side down on the lined cookie sheet. 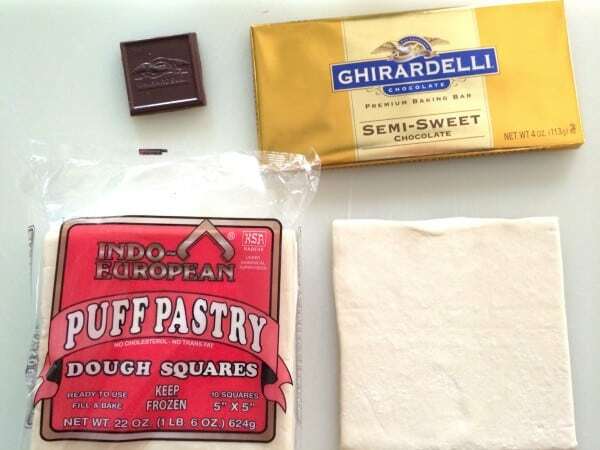 Keep pairing a half square of dough with a half square of chocolate. Brush the tops of the rolled croissants with egg wash.
Place the cookie sheet full of raw, rolled croissants in the freezer for about 10 minutes while the oven preheats. Heat a regular oven to 375 degrees Fahrenheit (or 367 degrees for a convection oven). Alternatively, following the baking temperature and time for your particular brand of frozen puffed pastry. Bake in the oven for 17-19 minutes until croissants are dark golden brown and cooked through inside. Cool on a rack. Resist taking an immediate bite because the chocolate is very hot just out of the oven. Serve once cool enough to eat. Store any leftovers in an airtight container on the counter. 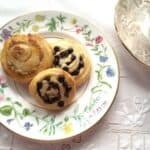 Wanted to read about these delicious looking and easy chocolate croissants. Wow! What a story to go with it. Love that. Glad to know you Dana. P.S. Saw those puff pastry squares today while buying phyllo dough. Should have bought them too! Patricia- thanks so much for letting me know that you appreciate my story. 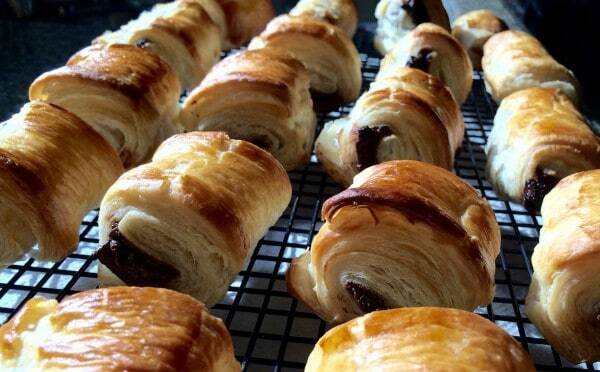 I’d love to hear what you do with the puff pastry when you have a chance to buy it. Wonderful post, so heart felt and honest! PS. Love the easy recipe. What a beautiful reminder of how precious life is. Thank you for being vulnerable and sharing your story. I have that pastry in my freezer right now and never thought of making croissants with it. I find most Armenian stores carry it in the San Fernando Valley as well. Looking forward to trying this. Cathy, how true. Great tip for finding the frozen puff pastry in other neighborhoods. Love this! So happy you posted. She’s lucky to have such a strong mom as a role model. My emotions are on my sleeve these days, more than usual, as my daughter has gone off to college. A glimpse of an old photo, a whisper of a song that she used to sing around the house, a mention of her by my son or my husband…it doesn’t take much to set me off now. I am trying to learn to accept it as part of the messy, bittersweet, beautiful aspect of living that you rightly point out. A lovely post about your daughter and your experience, and I am now looking for an excuse to scoot over to Bay Cities to snag some of that handy puff pastry. Hi Dorothy- sending your daughter off to college is a good example of when life is bittersweet. I hope you adjust to the new normal soon. Remember your bond is forever, and she is coming back. You will soon enjoy a new phase with her: a relationship with an adult child who shares your interests. And as for your trears ,ah yea u make me feel like a lame mommy to my 4 kids, lol that was super sweet of you. You do Rock! Stephanie- thanks for the mom support. I do feel she is here for a reason. What a great story, and such a fantastic comment. I loved reading this today. Hey Sharon- nice to hear from you. Thanks for checking out the writing that I’ve been getting into. Thank you for sharing your story about your little girl. And thank you for sharing wonderfully delicious recipe. Thanks for coming by to check it out. These remind me of the wonderful baked goods in Europe. Not too sweet, and heavy on the quality of the chocolate. I would likely eat more of these than I should! Thanks for reminding me how simplicity can be so darned delicious! It’s fun how food can take you to different times and places. These were delicious! I made them for breakfast today! YUMMY! – From a mama who wears her heart on her shoulder. Thanks so much for your comment. I like your perspective on my situation. That’s a helpful way to frame it. The small size is great for kids and for guilt-free adult indulging. Wow! What a real miracle that your daughter is mastering ice skating now; you are truly blessed! We realize how fortunate we are when the unexpected happen, but I always try to think of parents who are less fortunate than me, whenever these little bumps occur. Your croissants look fab and I’m sure your girls were so happy to eat them after skating! Yes, she’s our miracle baby. Thanks for stopping by to check out my post. The dough squares are handy. I’ve also used them to make turnovers by folding them over into triangles with apple filling. Dear Dana – Kudos to your daughter, she is blessed to have you as her mom. I cry over my children all the time. I am glad I am not the only one. I have one son who almost died of a traumatic head injury and had emergency brain surgery in 2007 and is 100% fine now. He is an accomplished clarinetist now, and every time he performs at his recitals, and when he gave the 8th grade graduation speech, the tears slip out and I melt. I also have a son with Down syndrome who has a lot of health and behavioral issues. I cry tears of joy at each of his little triumphs on the journey, because he has to work so much harder for each little success. Thankfully my other two boys are very healthy! 🙂 These croissants look absolutely divine and now my mouth is watering and I suddenly must have one of these flaky delights! They look beautiful and easy! Score! So easy that my older daughter makes these now. Hi Lana- thanks for reading my post. Our presentation helped empower me to print this story. I know two little grand daughters that I’ll be making these with next week! It’s the perfect recipe for little fingers. Dana, this is just lovely. You daughter’s determination is inspiring and will always serve her well, I’m sure. I find when I’m watching my kids do all sorts of things, my emotions always sneak up on me. Messy and bittersweet is right, and these croissants looks SO DELICIOUS! Thanks Valentina. It makes me feel better to know I am not the only one to have this reaction. Such a beautiful comment. Beautiful. She is an amazing young girl. And, the recipe looks great. Thanks Danna. I appreciate your comment.